I'm going to be real honest here because I've become a little discouraged by some design projects I've been working on. Why? Well, it seems like everyone who wants to blog doesn't always do the research to educate themselves on what goes along with blogging. It's come to my attention many "newbie" bloggers who are looking for a blog design are expecting their designer (me) to explain to them all the basics of blogging and how to build a brand. I simply design blogs. I do not maintain them and it's not my responsibility to have to teach you what a sidebar is or how a navigation bar works. It's also becoming more apparent that newbie bloggers are asking established bloggers details of how blogging works. In my opinion, it's part of the journey to learn this on your own and to educate yourself. In a perfect world, I'd love to be able to take the time to fully educate my clients because it's more of a personal experience but truth is, it takes me a hundred times longer to write an email explaining those details when I should be solely working on the aesthetics of the blog. So how do we fix that? I'm going to show a few images here dissecting a simple blog design (using Becky's as an example!) and give some details that I get a lot of questions on. 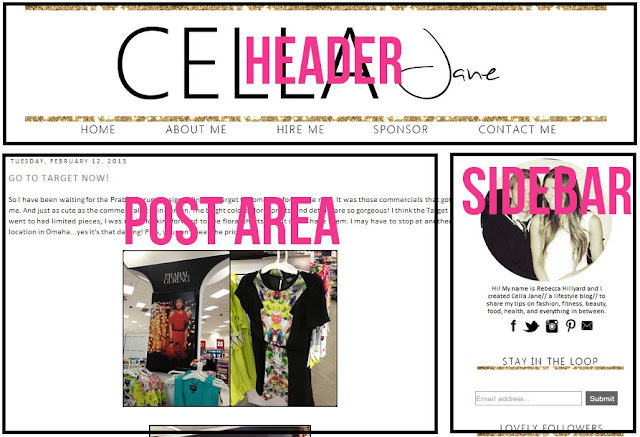 Plain and simple, the header is the main focal point of a blog design. Some times this can be alter to be on your sidebar with your navigation bar on the top or it can be even with your sidebar as mine is currently. This normally links back to your home page when clicked on unless additional coding is added for a navigation bar but it's usually always shown as above. Your date of the post published will show and the post title here. These act as details to disclose more information about your post. I have my date removed because I like the look with my design. You'll also see the post content here. You can center it, left justify or right justify. Play in your composing area to find a method and look you prefer here. Adding pictures in a blog post is always great reference also. Have fun with this content, it's what builds your blog! Sooooo many questions on what a sidebar is. Guess what? It's really easy.... a sidebar carries all the additional information with widgets. Each widget can be titled and Blogger gives you options to choose those widget you'd like included. The sidebar can be left or right justified depending on preference and the fonts and colors coordinate with the same as the post area. These are the pages you have active that can be clicked to redirect you to a new page with additional content. As shown on Becky's blog, she has four additional pages to her home page so when clicked on, the page shown coordinates with the title. These pages are a bloggers responsibility! When your design is created, those titles are built custom to match the overall design but the content on those pages are to be edited and changed up by you, as the blogger. Where can you find those? On your Blogger dashboard, there is a little menu arrow, click on the arrow and a list of categories will show, "Pages" will be one of them. Once clicked on, you're navigated to a new page that gives you the option to create a new page or edit current ones. This is also where you can find the links for each of those pages! NOTE: this is where you need to be when I as your designer am asking for your Navigation bar links. A small area with an image as reference and little details of who you are. This is also created as an image and can be changed by your designer at an additional fee in the future, if you choose to. I always link this image to your "About" page so when clicked on it redirects to your page that goes a little more in depth about you. Again, not all bloggers chose to have an "About" page but if so, that's how I link it. These are small icons for each social media platform you choose to have people connect with you on. When clicked, each one redirects to the site the icons corresponds with. Remember we talked about the sidebar and widgets above? As a designer, I can removed the titles that give the option to use in the widget settings and I build a cute, custom title that matches with the blog design. As shown on Becky's, her sidebar has titles for each widget she uses on her sidebar. Always get questions on this! Your favicon is a little icon that shows in your browser tab. Have gmail? Notice the little red and white envelope on the browser tab? Yep, that's a favicon. In the packages I offer, I create a little favicon to coordinate with your blog design. 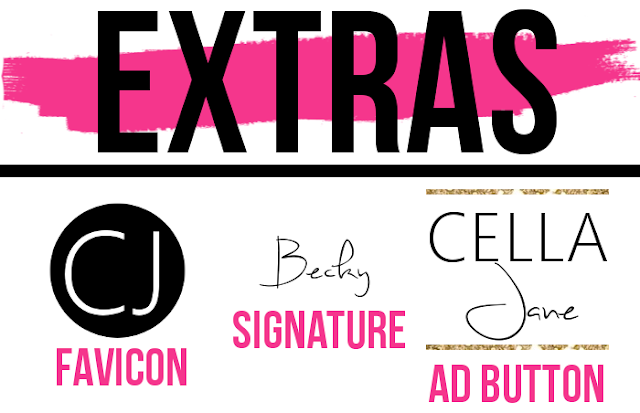 It's common to have a post signature with a blog design. At the end of your post content, your signature is embedded into your blog coding so it will show on the end of your blog posts. Also known as a grab button, designs include an ad button for you to use on sponsoring other blogs. You will also have the button with a "grab code" located on your blogs sidebar for readers to "grab" and put on their blog sidebar. This is great way to build more traffic to your blog and gives you a cohesive look for your brand. Now that I've dissected the overall design I hope that gives you a better understanding with the basics of a blog design. Myself as a designer has a hard time communicating with potential clients when they aren't aware of these details. It's little things that can be learned over time but it's much easier getting started on a design process being knowledgeable and accurate in your verbiage via communication. I promise you, it goes SO smoothly being educated. Additionally, in my order forms I ask for very specific details, it's much easier when clients have filled out all the areas requested for their design needs with accurate information. So many times I'm missing all the links to the Navigation Bar and the links for Social Media platforms. Without those, I can't code your design correctly and I can't be successful in making your design process smooth. Please know, I write this post and I spent a few hours getting it pulled together to relieve a headache of mine. My goal is to be able to have this link on my design site so anyone who needs a little detail or a refresher on a blog design, they can come to this post to learn. My sole purpose is to successfully build a professional relationship while building a custom and gorgeous design for each of my clients. I try to be as in depth as possible and I focus on treating each client of mine equally. My hope with this detailed post is to eliminate multiple emails with questions so we can begin a design project on the right foot. Lastly, a big thank you to Becky for letting me feature her blog on this post. Swing by Cella Jane for a dose of fitness, fashion and some great DIY projects! Oh, man. I can only imagine how much work time you've lost by having to explain all of this to clients. Clearly, it has happened enough that you took the time to write this post. This will definitely be helpful for your design business! Cheers to that! this is a GREAT post! I can't believe people are asking you to basically tell them their niche in blogging! keep doing what you do, it's wonderful! I agree with you! If I were a new blogger, then I would research blogging, until I got used to everything. Wow, thank you so much for putting in the time and effort to write this. I can't imagine how much time that took! Before I started my blog, and as I go along, I have been relying on Google and "self teaching" when I want to learn something new. This is such a nice resource, to have in one place. I LOVE all of your designs, keep up the good work! This is great. Hopefully if you get these silly questions still you can just link them to this post!! I've definitely had to explain a lot of that to design clients before - genius idea to post about it! Bookmarking this! I did a lot of research when I was getting my blog designed, but this still taught me some things. Thanks!!! Oh my gosh. When I said sit down and talk for hours over loads of coffee this is EXACTLY what I was talking about. You are speaking straight to my heart, girlfriend. I am empathizing with you right now. I cannot tell you how often I deal with this very same concern. I never want to disappoint but how do you tell someone nicely I'm not a blog teacher, I'm a blog designer. Such a touchy subject and you've masterfully answered the question. I struggled hard not to long back with clients not knowing the difference between Wordpress.COM and Wordpress.ORG sand then blaming me for their lack of education. It got so bad, I stopped advertising Wordpress blog designs! You go girl. I'm inspird to do a similar post. I feel like so many of these things are self explanatory, that it's kind of sad you had to do a whole post in order to explain it to people. I'm sure it can be incredibly frustrating having to explain these basic things over and over. I REALLY want to get a blog design from you, I'm just hoping that one day a bunch of money just falls into my lap so I can afford it. :) But eventually, it will happen. I love your work. INCREDIBLE JOB AUBREY!!!!!!!!!!!!!!!! I've been experiencing the same thing with my design clients. Bless you for taking the time to do this. I'm sure it's hard when bloggers know nothing and come to you for answers about how their blog works on top of wanting a design. This is a great beginning to helping educate new bloggers. Pinning. This is such a great post! Thank you so much! If someone doesn't know what a header is, they should lose their head. Why are people worrying about design when they don't even know what a sidebar or a header is?!?! That's the ting some people just don't want to teach themselves . You're so wonderful for posting something like this. I wish it wasn't out of frustration though! When I started blogging, google was my friend. Reading up on all the parts helped me to figure it all out. Reading posts by awesome designers like you helped me figure it out. My design is super simple, but I did it ALL ON MY OWN. You have no idea how proud of myself I was when I figured out the social icons! haha I wish some people weren't so lazy! Aubrey, you have no idea what timing you have with this post. I just kept saying AMEN over and over and over and over while reading this. I had to learn all of this on my OWN by doing a little thing called RESEARCH and inundating my web browser with bookmarks. I too am getting tired of answering the same questions over and over again. Great post. Unfortunately, if I keep getting the same questions, I think I am going to have to draft a similar post to address some of the same issues you have. you are the best. i'm going to definitely reference this post with future jobs! This was so informative! I'm new to blogging and this really helps. Thanks for the post! Most important point you discussed is that "I'd love to be able to take the time to fully educate my clients because it's more of a personal experience but truth is, it takes me a hundred times longer to write an email explaining". When you client is educated about the work definitely he/she will not waste your time and in this way you can easily satisfy him/her.